Sails / Products - Cruising / Racing Sails - Kent Sail Co.
Main sails can consist of standard or full battens, or they can consist of two full battens at the top and two long battens at the bottom. 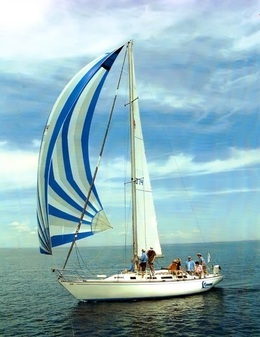 Sails can be made using Dacron sail cloth or newer Flex fabrics. This provides a laminate fabric in a crosscut design that can result in a lower cost. For lighter sails, instead of the furling cover being sewn directly on the genoa, a roller furling cover sleeve can be made to cover the sail while in port. 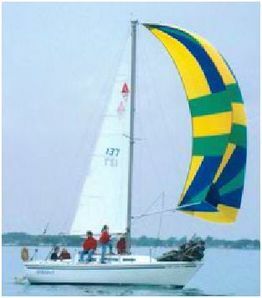 Spinnaker choices are either tri-radial or asymmetrical in design. 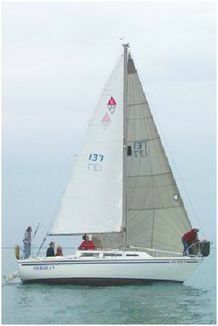 We recommend a heavy air jib as a second sail for more racing versatility. All PurposeTri-radial cut for use with a spinnaker pole or Asymmetrical cut for use without spinnaker pole.